Keeping track of upcoming shooting events and summarizing them for our Bulletin, Monthly Blog, and searchable Event Calendar is keeping the webmaster away from critical tasks. We are looking for a calendar/event assistant who can locate and update event info and upload that to the web. No special computer skills are required, but the candidate should be a careful typist and know how to digitally crop and resize photos. We will compensate the assistant for his/her time based on the amount of work involved. This would be a nice “side-job” for a retired individual, student, or somebody working part-time. If you are interested, please contact mailbox@6mmBR.com or post a comment below. 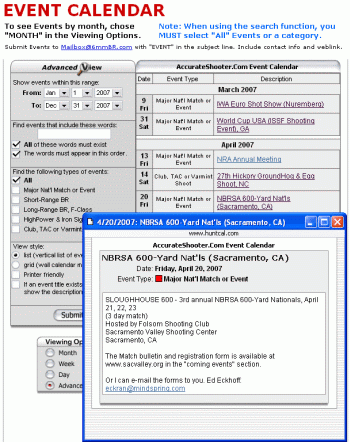 Share the post "Calendar/Event Assistant Wanted for AccurateShooter.com"